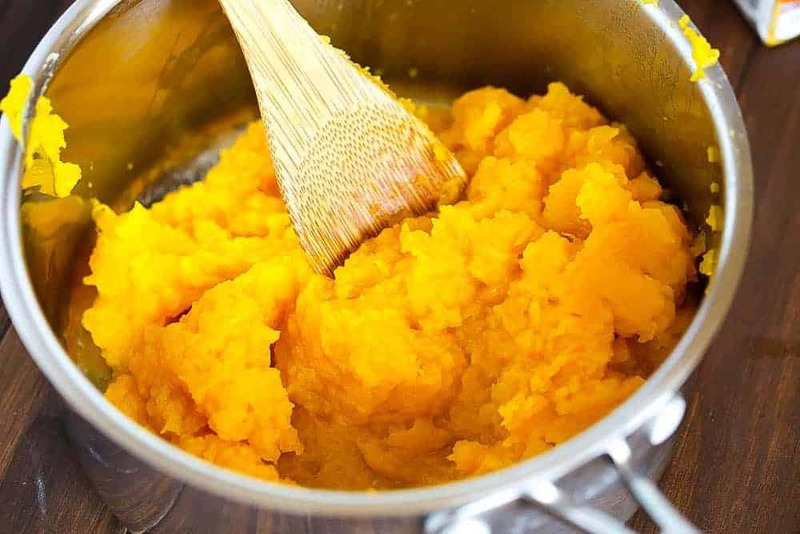 Want a rich and creamy pumpkin soup recipe that really fills you up but is also gentle on your lactose-intolerant tummy? You’ll love today’s recipe! It’s made with almond milk instead of dairy products. That also means that, aside from the honey, this recipe is perfect for vegans. If you are vegan, you can easily remove the honey or substitute it with some other plant-based sweetener without altering the taste too much. Another great thing about using almond milk in this pumpkin soup recipe: it’s much lower in calories than its dairy counterpart. One cup contains only 60 calories, compared to the 146 calories found in whole milk (and even compared to the 86 found in skim). It’s also low in sodium and has no cholesterol or saturated fat, making it a better choice for your heart health. Finally, almond milk is fabulous for your skin. It has 50% of your daily vitamin E requirement. 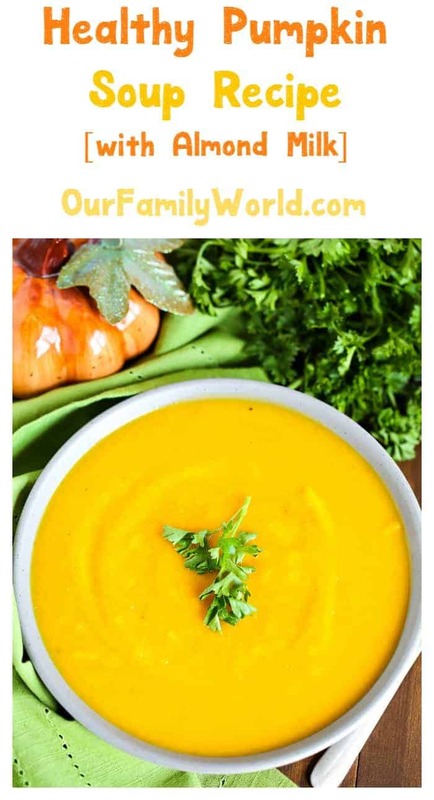 Let’s check out how to make it, then I’ll share some more benefits of this delicious pumpkin soup recipe as well as some other creative ways to use everyone’s favorite fall veggie. Don’t forget to print out the recipe card for later! There are so many ways to use this amazing vegetable in healthy ways aside from a pumpkin soup recipe. We’d love to hear your favorites! Tell us in the comments! 1 baked pumpkin (roasted/scraped out). Cut/scrape/cook pumpkin at 350 for 20-30 minutes. Read here how I do it. 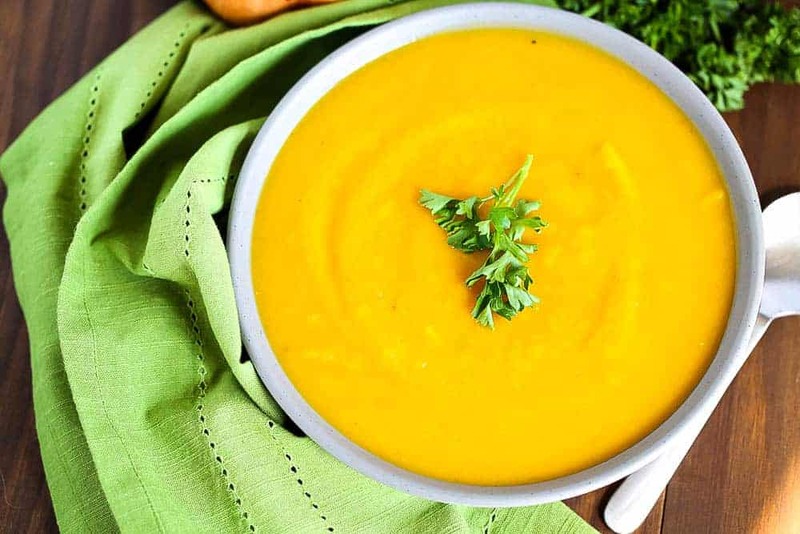 This pumpkin soup recipe is packed with some pretty great benefits for your health! 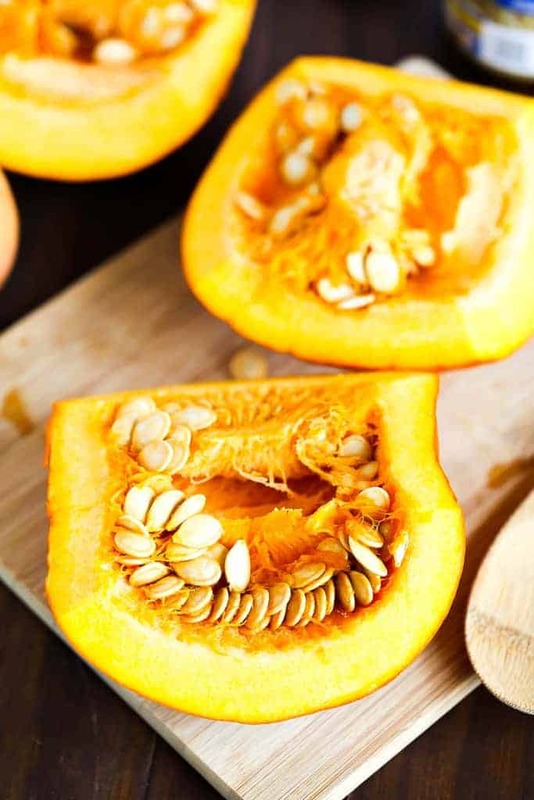 Did you know that pumpkin is high in vitamin A, a nutrient that helps maintain your healthy eyesight? A one-cup serving of the yummy veggie is also packed with fiber to help keep you feeling fuller longer, yet it only has 49 calories per cup! Combined with the almond milk, this particular recipe won’t break your calorie budget. Pumpkin is also loaded with other good stuff, like potassium and antioxidants. Pretty awesome, right? Now, even though this wonder veggie is so good for you, that doesn’t mean you can eat a whole pie and reap the benefits! We mix it into sugary treats way too often. 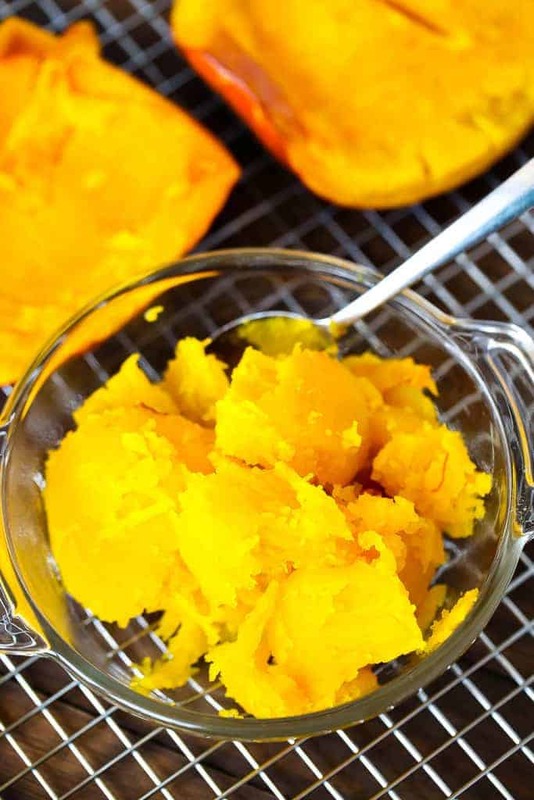 Instead of the usual sweet fare, check out some of these other healthy pumpkin recipes! 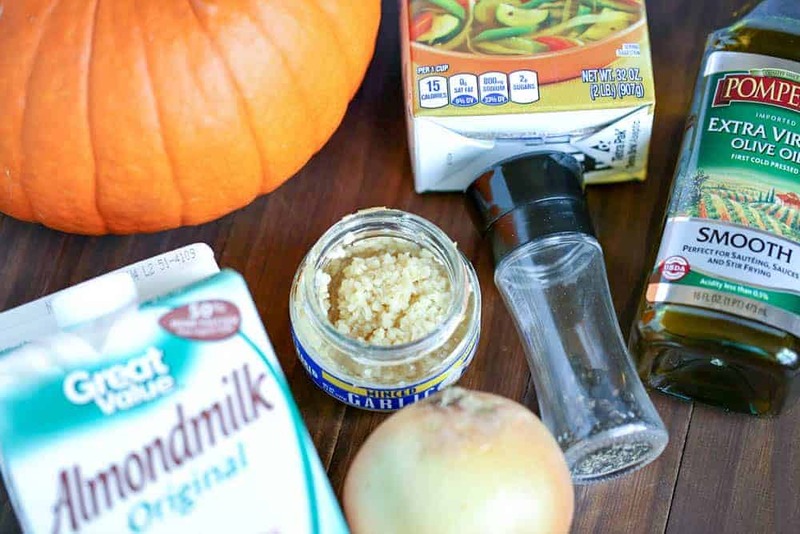 Easy Vegetarian Dinner Recipe: Pumpkin Risotto: another easy vegetarian recipe, this makes a great side dish or a meal! 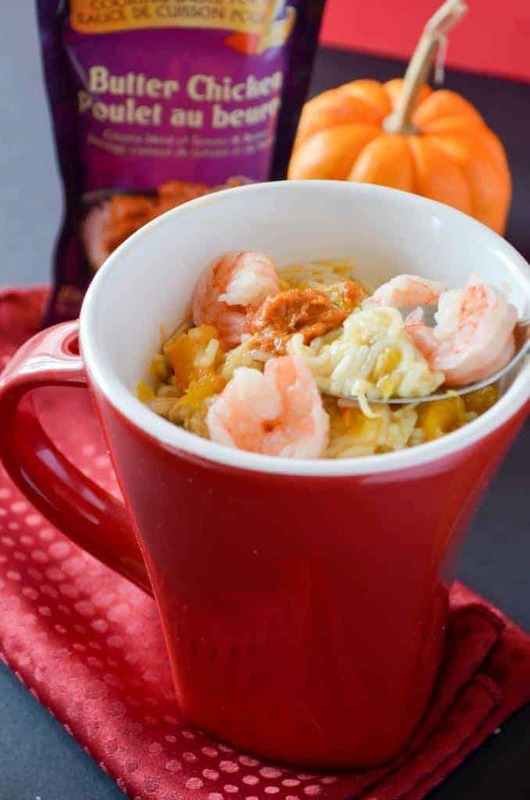 Noodles with Shrimps, Pumpkin & Butter Chicken: Pumpkin with shrimp? Yep, and it’s actually pretty amazing! 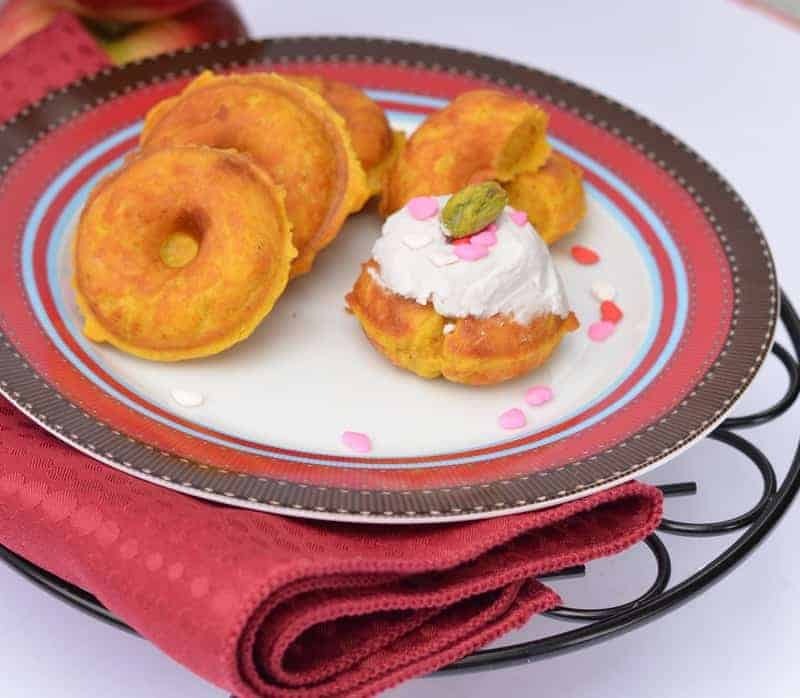 Pumpkin Mini Baked Donuts Recipe with Apple Sauce: if you really want to use pumpkin in a sweet treat, these baked donuts are a great way to go. Since they’re not fried, they aren’t as heavy as a traditional donut (or as loaded with fat!). Such a beautiful soup – love that it’s so light & healthy too! Stopping by from #FoodieFriDIY to do some sharing and to thank you for linking up! Hope you’re having a great weekend!! This looks wonderful! Our link party at Grandma’s House just opened today, we would love to have you there! I LOVE this easy soup recipe and recently switched to almond milk, so it’s perfect for us, thanks! What a good idea to use the almond milk to make the soup. This sounds really good to me. It definitely is Pumpkin season! You have to love everything pumpkin! I love pumpkin everything. This recipe sounds just dreamy for the cooler fall nights we are having. I have never had pumpkin soup, but now I want some! Tis the season for everything pumpkin, and I love all of these ingredients, I will definitely be giving this a try! That’s a gorgeous soup recipe! Perfect for impressing dinner party guests for the fall! What a perfect dish for a cool fall evening. I like that you used almond milk since I can’t do regular dairy. I love that you have made a healthy version of this soup. Makes it even better for those that are watching their diet to enjoy a soup like this. I have never made anything like this but it looks amazing. I will have to give it a try. My kids love pumpkin soup. This one looks creamy and delicious! Love that you used almond milk. I love Pumpkin soup when our weather change to super cold. Yes please! Tis the season for a thick and creamy pumpkin soup and this one sounds delicious. As someone with dairy and lactose issues, I appreciate the almond milk as well. That soup looks absolutely amazing. Fall is the perfect time to curl up with a warm bowl of soup. Thanks so much for sharing this recipe. I love making foods using almond milk. It’s a great way to get a little extra health kick in. That sounds absolutely delicious. Pumpkin soup is one of my favorite dishes when the weather starts to turn. Yummo!